Spinal Rejuvenation Therapy is the restoration of the spinal curves and range of motion. While the spine can easily degenerate it can also be regenerated; and the effects of spinal damage can be reversed. This is a highly specialized area of spinal care. Just like in specialized fields of medicine, doctors of chiropractic also have higher levels of training in neurology and spinal correction. At Stucky Chiropractic Center, this is just one of the many specialized areas of care we are skilled in providing to the people we serve. 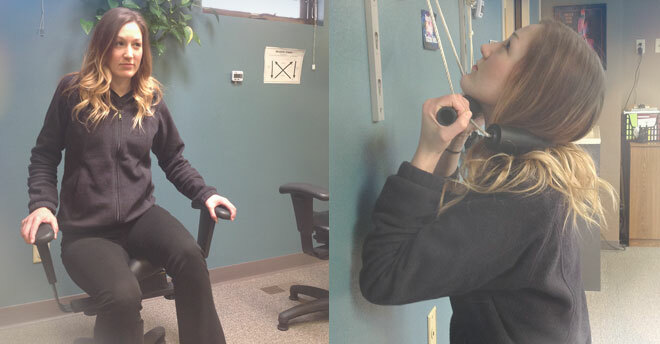 The photo above on the left is a wobble chair used in Spinal Rejuvenation Therapy, while the photo on the right is an example of repetitive cervical traction. Warms up the discs prior to spinal molding to reshape the spine more easily. Reduces stress in the low back & aids in the prevention & recuperation of injuries. Enhances oxygenation of blood & stimulates metabolism, which is necessary for the prevention of disease. Helps circulate CSF (fluid that nourishes the brain & spinal cord). The Cervical Traction is used for loading and unloading cycles that reestablish motion in the neck and upper spine, hydrates discs and prepares for restoration of spinal curves. The 6-Way Stretch strap gently helps in stretching stiff, sore neck and upper back. If you’ve purchased a Home Kit from Stucky Chiropractic Center and would like additional information on how to use the various pieces of equipment, visit our Home Kit page to watch step-by-step videos on how to properly use your Home Kit and perform stretches at home.